User experience (UX) has become a core strength in building effective marketing campaigns, websites, and digital interactions. Users—people—are the reason we build anything, and providing an easy, intuitive experience is the best way to guarantee satisfaction for the people using what you build. Even Google has begun to shift to a user-first approach that rewards effective online experiences over heavy content creation. At Clearlink, our team of UX experts are dedicated to improving the functionality and seamless experiences of our websites, products, services, and tools. Let’s walk through some UX basics we’ve identified from our years of industry knowledge. First, it’s important to understand the difference between UX and UI (user interface). While the terms sound more or less the same, the two are fundamentally different: UX describes conditions of the interface that a user must engage with to accomplish a task; UI is the actual interface itself. The Nielsen Norman Group gives the example of a movie review site: “Even if the UI for finding a film is perfect, the UX will be poor for a user who wants information about a small independent release if the underlying database only contains movies from the major studios.” User experience goes deeper than what a person will see on their screen; UX considers how quickly or slowly a server responds, how searchable a database is, how intuitively a buyflow moves from one step to the next, and how trustworthy an interface design feels. UX addresses every facet of an experience, including planning for emotional states and errors. In order to plan for a user’s emotional state, especially when an error is triggered, UX experts talk a lot about empathy. Different from sympathy (where you can sort of imagine a person’s troubles and feel sorry for them), empathy is the act of putting yourself mentally in the other person’s shoes and feeling their needs, frustrations, and desires acutely. Empathy is feeling the reality of someone else’s context. Paul Boag suggests that to develop your empathy skills, you should try expanding your daily experiences and interactions to places and people you wouldn’t normally see. He believes that the more we expose ourselves to new and different interactions, the better we’ll be able to understand the web through someone else’s context—and the better we’ll be able to empathize with their needs and desires. In our experience, value should always be at the center of every project. If your information doesn’t provide valuable help or answers, there’s no use offering it in the first place, no matter how findable, credible, or accessible it is. 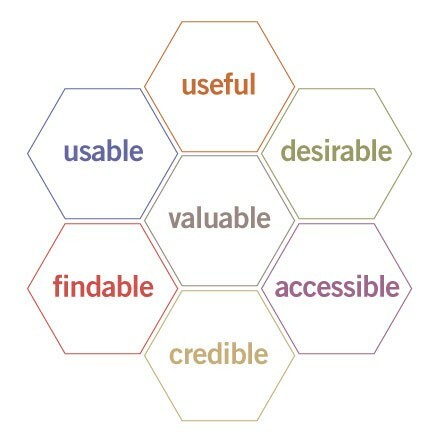 Once you’re sure that the core product, service, or site will be of value to users, the rest of the honeycomb is easy to incorporate. You are not your user. You don’t think like them or act like them or buy like them, so don’t design the experience for yourself. Users are human beings. You can’t expect users to follow the logic or steps that a robot (or search engine spider) would. They need things plain and simple. Users are irrational, unpredictable, emotional creatures. They don’t like feeling manipulated, they don’t like barriers between them and the thing they need, and they sometimes change their minds for no apparent reason. Users are the whole reason we do this. They make our jobs—and make them rewarding, too. Don’t give up on your users or fall back on blanket statements about them. Find ways to ask them what they want and act on those requests. The results will be worth it for you and your users. You can learn more about Clearlink’s approach to UX by reviewing our series on the connection between effective user experience and SEO strategy. If you’d like to dig in deeper, start with this crash course on UX by Joel Marsh. He outlines thirty-one fundamentals of user experience and walks you through some quick examples. Plus, the whole thing is user friendly. Each element is about a four-minute read. Usability.gov also offers a clear overview of where UX sits in a team or department. If you’re curious about some of the more specific pieces around UX, user research, and interface design, check out this UX glossary by Pidoco.